This is a side step card. 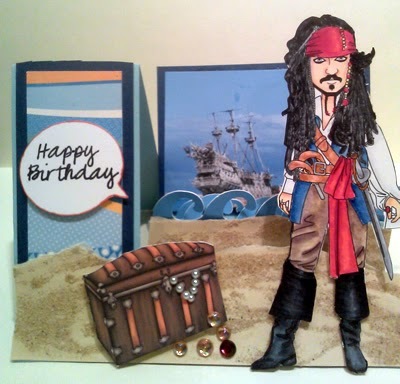 The image is "Captain Jack" from Sassy Designs Studio. The trunk is an image from Doodle Pantry which I added jewels to. Jack was colored with Copic markers. The sand texture is...sand LOL. What a mess it was. The ship in the background is the actual ship used in the movie. It's been kept at Disney Cruise lines private island. But not any more, it was meant as a prop and couldn't withstand the weather. 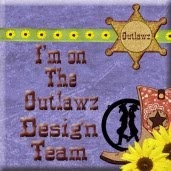 This card is my DT entry for Outlwz Paper Ala Mode - Special folds challenge. 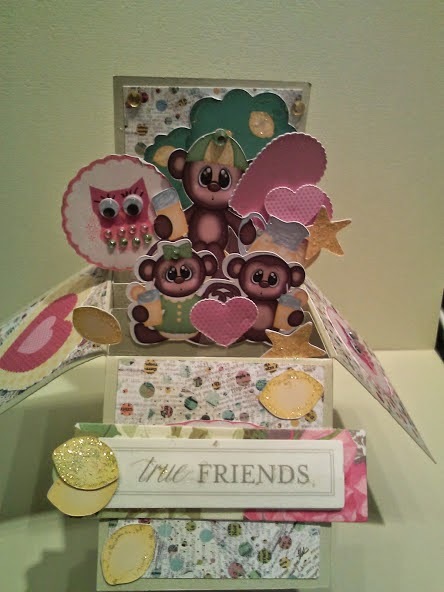 For this popup card box I used "Lemonade Monkeys" from Kadoodle Bug Designs for the fun inside elements. This is a cut file and the art. I used the colored versions and did a Print & Cut with my Cameo. I added the hearts and owl from my digital stash. My 2 year old grand daughter loves monkeys and owls. Boy did she have fun while I guarded... I mean made this card! She got my trial run without rhinestones. 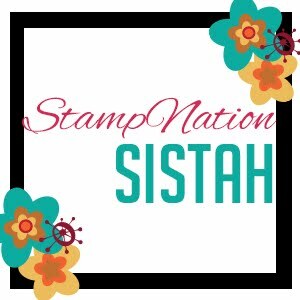 I made a cut file for the box part that you may have"
There is a tutorial for making your own if you don't want to use a cut file at Split Coast Stampers. Also an assembly video. There is 1 piece of 12X12 card stock (double sided would be nice but I didn't have any). 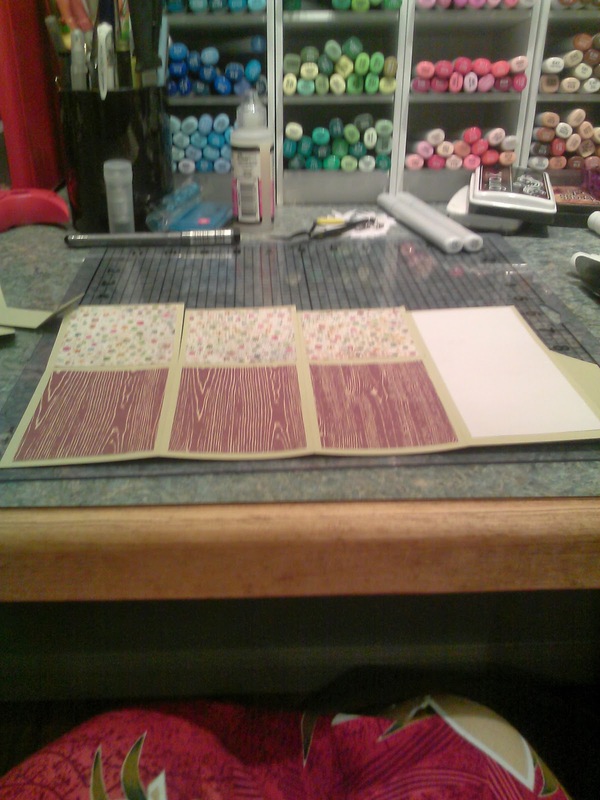 The cut file I made has a sample pic of front and back. This is the back. The first cut I made using Silhouette Studio score lines and didn't like at all. This is a Bazzil texture stock. In my cut file I have cut lines grouped and score lines grouped. Load the mat, change blade to 1 (I left pressure at 33). Select the cut lines and turn them to NO Cut. Then select score lines and change to Cut. Now cut. On this heavy stock it didn't appear to do any thing...but it scored perfectly. DO NOT UNLOAD. Now change score to No Cut and box outline to Cut and cut. Add the decorative panels and the 2 inserts. Glue the tab to side of box. This is the box put together. The hardest part is putting in the center strips. Now all the bits get attached. 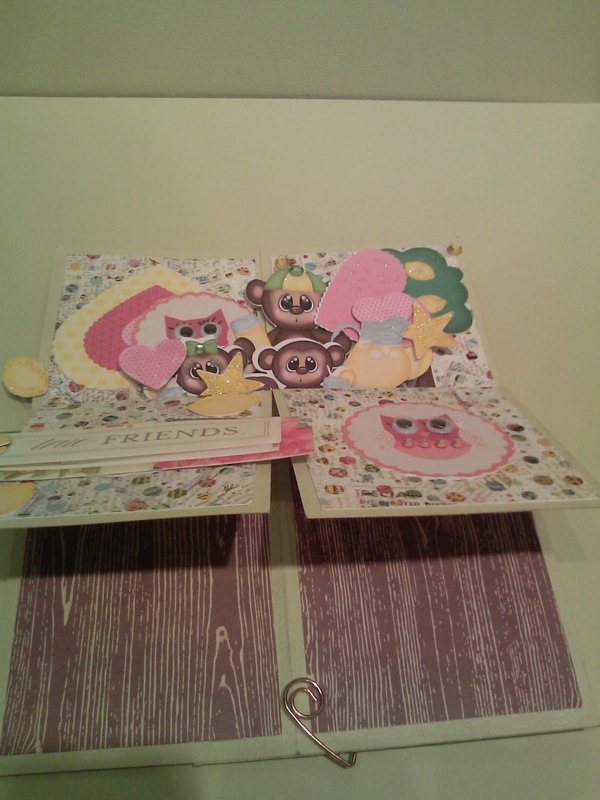 I put the monkeys directly on the tabs. The tree glued to back panel. Owl and hearts were first glued to acetate strips. You can position sideways or whatever. Be sure nothing is taller than the box. For mailing raise the flaps. This size fits a 6X6 envelop. Because of my sentiment I will make a 6X7 envelop.